When was the last time you smiled as you turned the ignition key? 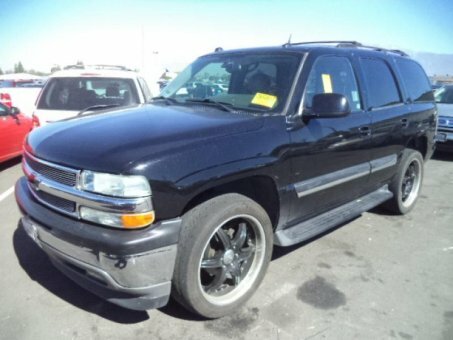 Feel it again with this wonderful 2005 Chevrolet Tahoe. It is nicely equipped with features such as Cargo Package, Sun, Sound & Entertainment Package (Automatic Tri-Zone Air Conditioning, Electric Power Tilt-Sliding Sunroof w/Express-Open, and Rear Seat Entertainment System), 4WD, ABS brakes, Alloy wheels, Custom Leather Seat Trim, Electronic Stability Control, Emergency communication system, Front dual zone A/C, Heated door mirrors, Illuminated entry, Low tire pressure warning, Power Adjustable Pedals, Remote keyless entry, and Traction control. A comfortable, roomy machine that gets surprisingly good gas mileage. It offers more power and more seating capacity than its predecessor and adds safety features such as side-impact air bags.